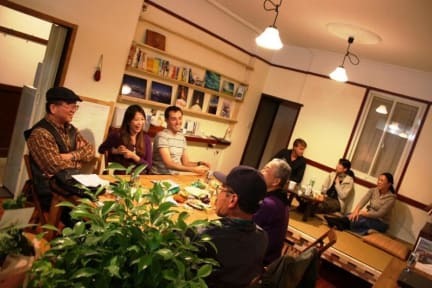 Visitors love the friendly homestay vibe of this small, centrally located guesthouse.Pleasant rooms with homely touches are kept spotlessly clean.There's free wi-fi and a shared kitchen. *Please inform us for the arrangement if your arrival time is later than 9:00PM. *We can keep your luggage before check in and after check out for free. We have two dormitory rooms and one private room. All rooms are Japanese style and lovely tatami mats. Shower room and toilet are shared. *We offer 2.2meter length bunk bed which was made by carpenters of Hida, you can put your luggage on your foot or head side. Each bed has a personal bed light and plug for charge. You can use your Lap top on your bed by WiFi. Japanese style tatami room,maximum 3 person. You can use your Lap top on the room by WiFi. -We accept the payment by only cash. -We have no curfew.The entrance door is locked for security during 11:00PM-8:00AM. Amazingly close to station, nice location with friendly staff. Since Takayama is a small place, food & getting around is convenient too. Accommodation is clean and comfy, facilities are well kept too. Won't hesitate to recommend to others and definitely good for long stay too. On arrival staff were very friendly and helpful, giving us all the information we needed about the hostel and a great map of attractions/restaurants. The beds were comfortable with lots of room for bags as well as lockers for valuables. Only complaint was that the shower room was quite old but still clean. The staff were always on hand to help with any questions we had! 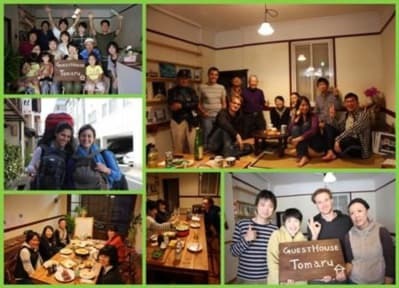 Overall a great, clean and friendly hostel in an amazing location for exploring the town and SO close to the station. Wonderful hosts, full of great information and willingness to help. I was very fortunate to be there on BBQ night. One of the best $Y1000 I've ever spent. Beautiful feel to the hostel. A mix of Japanese old fashion style with modern backpacking. Very helpful for ongoing trips too. It is close to the station and a short walk to the sightseeing spots. The staff is nice. There is a small kitchen and a fridge available. I think it is a simple styled hostel with a nice common room. I only stayed one night so it is hard to get a complete impression on it. A simple yet very confortable hostel. Really close to the Takayama JR Station and the Old Town. If you're looking for a place to interact and socialize with other guests, this might offer limited options (the social spaces are pretty small and the kitchen not so big).